Jan Wong knows food is better when it’s shared, so when she set out to research home cooking in several countries known for their distinctive cuisine, she asked her 22 year old son, Sam, to join her. While he wasn’t keen on spending excessive time with his mother, he dreamed of becoming a chef. Ultimately, it was an opportunity he couldn’t pass up. 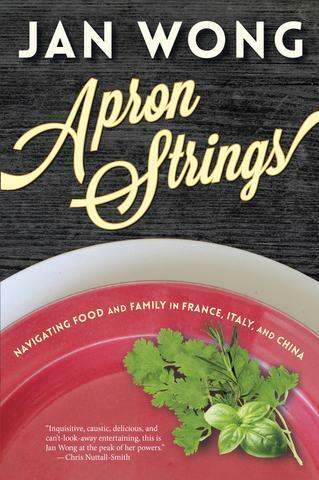 The result of this exploration is Jan’s latest book, Apron Strings: Navigating Food And Family In France, Italy, And China. In this book, Jan tells the story of their journey. Jan and Sam live and cook with locals, observing close up how globalization is changing food, families and cultures. Along the way, mother and son explore their sometimes fraught relationship, uniting – and occasionally clashing – over their mutual love of cooking. This entry was posted in COMMUNITY SERVICE and tagged Apron Strings, author banquet, Jan Wong. Bookmark the permalink.